For this section of the proclamation, I am going to post a couple of articles for review and keep my comments brief due the sacred nature of this topic. The words and voices of those who will teach this topic are servants of the Lord. Their counsel is worth deep consideration. If you want into a LDS home, chances are you may run across a print of The Proclamation hanging some place in that member’s home. Just like pictures of the temple and the Savior, this document hold a place of importance in the lives Latter-day Saints. These are just a few samples of some of the options I have looked at for my home. 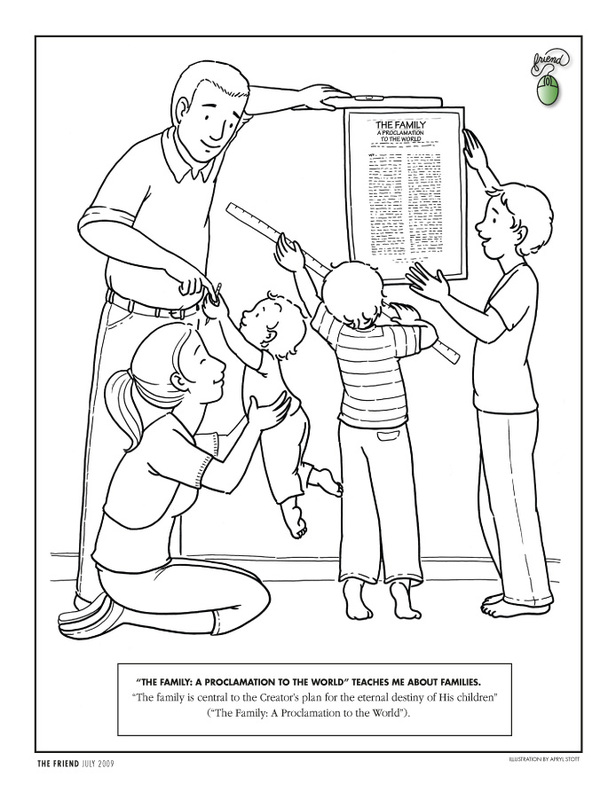 Here’s a place where you can print a ‘‘fun” copy of the Proclamation for yourself. Ok Guys…If you are seeing this.. share it with your friends. Share it with the young gals in your circle of influence. You can make a difference. You and your voice for virtue and modesty — can change the world. In our Heavenly Father’s plan of happiness, a man and a woman can be sealed to one another for time and all eternity. Those who are sealed in the temple have the assurance that their relationship will continue forever if they are true to their covenants. They know that nothing, not even death, can permanently separate them. The covenant of eternal marriage is necessary for exaltation. The Lord revealed through Joseph Smith: “In the celestial glory there are three heavens or degrees; and in order to obtain the highest, a man must enter into this order of the priesthood [meaning the new and everlasting covenant of marriage]; and if he does not, he cannot obtain it. He may enter into the other, but that is the end of his kingdom; he cannot have an increase” (D&C 131:1–4). Every time I see this Mormon Message tears fill my eyes and hope fills my heart. I love the tenderness between this couple. It isn’t strange to us as members of the Church. It is something we look for to and long for as covenant keepers. It is something we will every marriage could know. Most people think of a marriage made in heaven as a rare occurrence in which both parties are deeply in love and highly compatible. We like to think that all our marriages are made in heaven. When a man and woman enters one of our holy temples to be married, they covenant (or promise) they will stay together forever—on earth and in heaven after they die, if they are faithful to each other and their promises to the Lord. A temple marriage doesn’t include phrases like, “Till death do you part” or “So long as you both shall live.” If we keep these promises, our children also become part of this heavenly promise—sealed to us forever. Not every marriage will last. Sometimes, through no fault of one spouse or the other, the marriage will need to dissolve. However, most marriage troubles can be resolved by following the counsel of Elder Dallin H. Oaks. At this time in the world, when the adversary is unleashed and tirelessly working on the destruction of the children of God, we cannot be warned enough to protect our homes and families. In the Church we are blessed to have a prophet, Thomas S. Monson to follow. We know he walks and talks with the Lord and directs the Lord’s church at this time here upon the earth. When the prophet, his counselors, or any of the Quorum of the Twelve speak — it is wise to listen. Do you need to add additional protection to your home? I hope this blog will give you a small taste of the many wonderful resources that are available to study the doctrine on the family. If I can suggest a challenge to get your family together, start at the beginning with my first post. Follow each of the paragraph posts, reading each of the talk or devotional links and watching the videos. It’s a great Family Home Evening opportunity, that I believe will strengthen each family member. I have loved the in depth study this semester on The Family, A Proclamation to the World. I have gained a deeper understanding of this important document and have a stronger testimony of it. I have studied some amazing conference and devotional talks on this topic. I have studies scriptures and watched some of the best videos on the family. I have come to know my Savior even more as I have asked for His help this semester and as I have pondered the assignments for this class. I am grateful for the gospel of Jesus Christ and for the plan of salvation. I am grateful for my family of birth. I was born to goodly parents. They taught me the gospel as they were commanded to do and set a beautiful example for me to follow. I am grateful for my husband, children and now grandchildren. I am richly blessed. I have a loving Father in Heaven who has provided for me and my family and for all family members of the world to have a way to return to live with him. God loves all his children, of this I have no doubt. The trials of mortality, though many feel unbearable at times, are to help us learn to be like him. Of this I have no doubt. I have experienced this training and tempering in my own life. Peace can be found within The Church of Jesus Christ, joy and love can be found within the family unit. Families can be together forever. Of this I bear my witness, in the name of Jesus Christ. Amen.